This chilling footage shows the shocking moment a Palestinian woman lunged at an Israeli security guard with a knife in broad daylight. The guard was standing at the entrance to the West Bank settlement of Beitar Illit, six miles south of Jerusalem, when the woman casually strolled up to him. 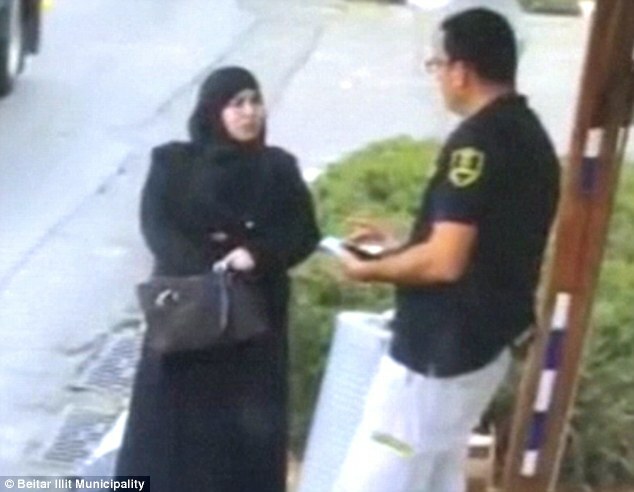 The woman, who was wearing a black abaya and hijab, was asked for her identification to enter the predominately Jewish city. As the guard started flicking through her papers, the Palestinian woman reached for a knife from inside her bag and tried to stab him. The guard, who was named locally as Yishai Kreitenberger, 33, was taken to Shaare Zedek Medical Center in Jerusalem with minor injuries. He later described the events leading up to the attack. He told the Algemeiner Journal: 'I was standing at the city's guard post when I noticed the terrorist walking towards me…she was tense, looking around [as though] she was unfamiliar with the place. 'As she approached, she presented her green Palestinian ID card. The woman, named locally as 22-year-old Hilwa Salim Darwish, was shot in the street and taken to Hadassah University Medical Center in Jerusalem's Ein Karem. After she was shot it was reported a number of Palestinians from the village across the road began to protest. The municipality then ordered Palestinian workers in the city to head home for the day over fears a riot would break out. Meir Rubinstein, mayor of Beitar Illit, said a tragedy had been prevented and people in the settlement were 'determined to go on [and] continue with our routine'. In a separate incident earlier today, border police shot and killed a Palestinian terrorist who rammed his car into a group at a hitchhiking station in the West Bank. Four people were injured in the attack, including a pregnant woman, Israeli police said. Since the violence broke out again in September, 11 Israelis have been killed in Palestinian attacks, most of them stabbings, while 74 Palestinians have been killed by Israelis. Israeli claim 43 of those Palestinians killed had planned to carry out attacks with knives, guns or cars. The latest round of violence between the two communities began in mid-September following clashes at the al-Aqsa mosque/Temple, a site sacred for both Muslims and Jews. Soon afterwards, a suspected cell of the Islamist movement Hamas murdered a Jewish settler couple in the West Bank in front of their children. Israel have blamed the violence on the actions of Palestinian political and religious leaders. Palestinians put it down to a lack of hope for gaining independence after years of failed peace efforts.